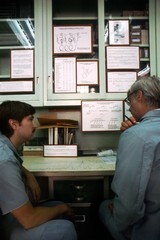 Two Caucasian male scientists conferring over a graph. They are in lab coats in an office setting. The new technology available to the scientists today plays an important role in providing them with needed detailed information.